The crunchy tostada shell makes a tasty base for yummy toppings. A great snack, particularly if there are left-over roasted or boiled potatoes in the fridge! Put tostada shell on a small microwavable plate. Arrange pieces of ham over tostada shell. 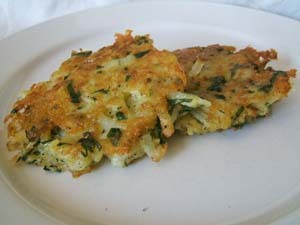 Top with cooked potato and sprinkle with cheese and green onion. Put in microwave and cook on high until cheese is melted and bubbling, about 30 seconds. Let cool slightly before eating. Pizzazz Potato Tostadas - Replace the ham with pepperoni slices and spoon a little pizza sauce on top; add potatoes and sprinkle with Mozzarella and any of your other favourite pizza toppings. 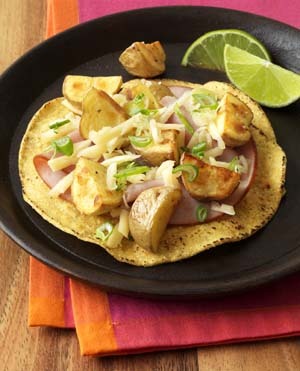 Potato Club Tostadas - Replace the ham with sliced turkey, add potatoes, crumbled bacon and cheese. Microwave as above and top with shredded lettuce and diced tomatoes before serving. Kids will love to make and eat this recipe! Microwaved baking potatoes stuffed with sure-fire pizza toppings. Adult slices potatoes. Kids microwave potato halves, scoop out insides to prepare filling, and stuff potatoes. Use large sharp knife to cut potatoes in half along lengths of potatoes. Use a fork to prick each potato skin three times. Place potatoes cut side down on microwaveable plate. Microwave on high for 4 to 5 minutes, or until a fork pierces potato easily. Leave potatoes on plate, but remove plate from microwave and cover with clean tea towel for 5 minutes to let potatoes cook some more. Meanwhile, mix pepperoni, tomato sauce, Parmesan cheese and margarine or butter in a bowl. Set aside. After potatoes have been under the tea towel 5 minutes, use a spoon to scoop out potato inside each half, leaving a thin shell of potato inside skins. Put scooped potato into bowl of pepperoni mixture. Stir gently to mix together. 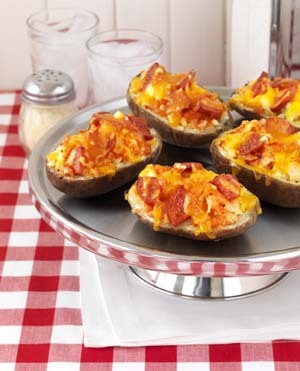 Fill potato shells with potato-pepperoni mixture. Sprinkle tops with grated Cheddar. To finish cooking, place on baking sheet and bake 15 to 20 minutes in a regular oven preheated to 400 F (200 C), until cheese is lightly browned. Or heat in toaster oven until cheese is browned. 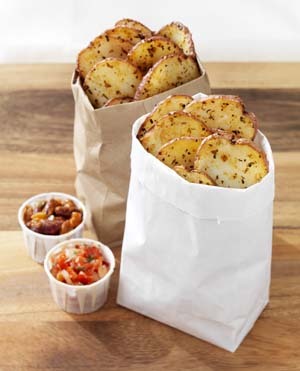 Makes 4 Pizza-Style Stuffed Potatoes. The smokey cheese adds another element of flavour to these crisp pancakes. Serve with sour cream and salsa on their own or as an accompaniment to chicken, fish or beef. In saucepan bring water to boil. Add potatoes and boil for 10 minutes. Drain and let cool slightly. Grate potato into bowl. Add cheese, egg, garlic, parsley and basil, salt and pepper and stir until combined. Heat butter and oil in nonstick skillet over medium high heat.Using 1/4 cup (50 mL) of the mixture, place in pan and flatten slightly to form pancake. Cook, turning once for about 10 minutes or until golden brown and crisp. Repeat with remaining mixture. 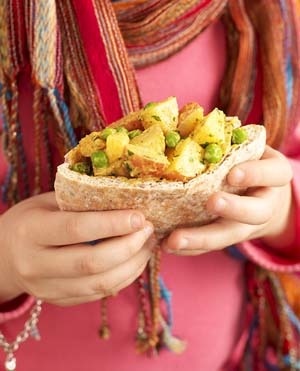 A vegetarian sandwich with a fragrant Indian-style potato filling for families who want a tasty change of pace. * A fragrant, non-hot Indian spice available in supermarket spice sections or bulk spices. Cut unpeeled potatoes in 1/2-inch (1 cm) dice. (An adult should peel and dice for young children.) Place in microwavable bowl, cover and heat on high 6 minutes, or until potato is tender and can be pierced with a fork. Use oven mitts when removing cover. Be careful, steam from bowl is hot. Pour frozen peas over potatoes, re-cover. Cook on high another 2 minutes. Set aside. Put in saucepan (no heat at this point), yogurt, green onion, tomato sauce, olive oil, cumin, garam masala (if using), garlic and salt. Turn heat to medium-low, stir mixture and gently simmer 2 minutes. Reduce heat to low. Add potatoes and peas to saucepan and mix well. Cook, stirring, for about 1 minute, until most of yogurt mixture is soaked up by potatoes. Take off heat. Stir in lime juice, if using. Use a potato masher or wooden spoon to break apart potato chunks, but do not mash completely. To make samosa sandwiches, cut pita breads in half. Use fingers to split open pockets. Fill each pocket with about 1/2 cup (125 mL) potato mixture. Gently press pita bread to even out potato layer. Fill six pita halves. Place pitas on baking sheet. Bake about 8 minutes in 350 F (180 C) oven, or until pita bread is crisped and filling is warmed through. (Note: Filling can be covered and chilled up to two days for sandwich-making as required). Makes 6 Potato Samosa Pitas.